Why are so many people addicted to Cross Stitch? Cross stitch is reported to be the oldest form of embroidery. And though it can be found all over the world, many of us didn't have to go far for our own traditions. Those were lovingly formed in the warmth of our own homes by our grandmas and moms and aunts. Some of us continued to stitch throughout our lives, while some are newly-inspired to begin stitching again. Quickly scan our tutorials and, just like riding bicycle, it will all come back to you. Pause a little longer on those items that have changed since you last stitched. Simple or complex - you choose! 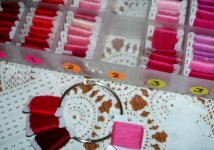 The majority of cross stitch designs, large and small, are completed using a single stitch! Learn that, add a handful of others, and you'll soon be stitching like a pro. Go to Getting Started and check out our Stitch Tutorials. You'll find that our clear, detailed diagrams and easy-to-follow instructions provide you with everything you need to know. Still have questions? Click to email me anytime! 1) Put one by your favorite chair at home, perhaps a larger or more complicated design. Make it convenient and you'll find yourself stitching anytime you sit. 2) Slip a smaller project into your purse or bag. Use a plastic zip bag to protect your chart, fabric, floss, needles, threader. Take it out anytime you have to wait - in the doctor's office, picking the kids up from school, you know those times. Now you can look forward to waiting! And unlike knitting, you don't have to finish a row before you put it down. Cross stitch is one of the least expensive hobbies. Click to find free patterns online, then click for ideas on how you can get started for around $20. You don't have to spend a lot of money upfront on a craft you've never tried before (but trust me, you're gonna love it!). Endless possibilities for treasured keepsakes! Meaningful, personalized, framed words and images. Greeting cards that become framed works of art. Christmas and holiday ornaments and decorations. Countless cute, engaging images stitched for baby. Creatively customize one-of-a-kind pieces or faithfully reproduce the original artwork of the designer. Either way, you've created hand-crafted heirlooms that will be treasured for generations to come. Make a simple combination of stitches on a grid pattern, and you've quickly transformed ordinary fabric into beautiful pictures, words & designs. Now that's the appeal of counted cross stitch! I know that it's sometimes hard to trust something that is free. But here, you can. Each chart I've designed comes with detailed, step-by-step instructions. Most importantly, we stitch each and every one of our designs before we post it. That is your guarantee that each chart can be stitched with confidence. 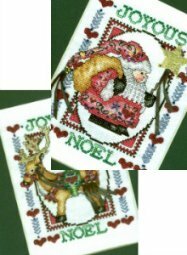 Great original cross stitch patterns, detailed lessons, how-to tips, photos and videos. You have everything you need to begin your cross stitch adventure today!